A hungry student who took my Mushrooms of Field and Forest class in 2007 wrote this mouth-watering post. Although I grew up equidistant from a large woodland and the local grocery store, I never would have thought that they contained some of the same products. The woods had carefully marked trails and swimming holes, the supermarket carefully marked bins of produce and even mushrooms. But the second week of my Field Mycology class, I collected my first bolete, something I’d thought I could only buy dried at my supermarket. The process of finding and eating boletes is much different in the wild than it is in civilization, so I’ll describe the path from the forest to the mouth for a delicious bolete. The most coveted boletes belong to the Boletus edulis group (right), and are rarely found fresh in stores; generally only dried boletes appear. Unlike white button mushrooms, boletes are not saprobes that can grow on compost; they are mycorrhizal, forming relationships with trees. Due to the expense and complications of trying to cultivate a mushroom with a specific tree, there has been little success, so boletes are always collected from the wild, making them uncommon and expensive in supermarkets. However, the good news for collectors is that because they are mycorrhizal (symbiotic with certain trees), they will recur in the same places each year. Because boletes are mostly water, dried boletes barely resemble fresh ones. While the dried boletes appear very similar to other dried mushrooms, fresh boletes are thick and fleshy, and distinct from other mushrooms because they have a thick sponge of tubes (often yellow) on the underside of the cap, instead of gills. However, although it is generally easy to recognize a mushroom as a bolete, identifying your bolete to species can be more difficult. This is an important step, because many boletes are either poisonous, or simply not pleasant to eat. (In France, pharmacists will check your mushrooms for you–all are trained in mycology). Once the mushrooms have been properly identified, it’s time to begin preparing them. 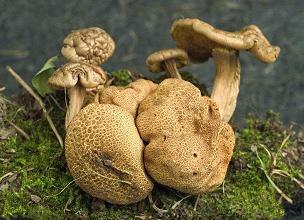 Boletes rot quickly; any wet and mushy undersides or insect-filled stems should be discarded. The hard or fibrous stem of an older bolete should also be removed. The best boletes are small and firm. The choicest specimens can be served raw, thinly sliced with lemon juice and oil. However, there are a variety of cooking methods to best showcase the meaty flavor of boletes. The classic French method includes three stages. First, the mushrooms are partially dried in the oven to remove some of the water. Then, they are stored in the exuded liquid, so that the flavor is not leached away. Finally, they are sauteed, to brown and cook them. And though I may have seemed to disparage dried boletes as very unlike fresh boletes, dried boletes are not inferior. In fact, the distinct change that takes place during drying is seen by many as an improvement. The enzyme action and browning reactions that take place during drying give the dried bolete a powerful taste that can be used to infuse many foods with its umami flavor. And they last as long as a year. Dried boletes should first be soaked for 30 minutes, and as with fresh boletes, the liquid is highly flavorful. When the rehydrated boletes are sauteed, they will have more flavor if they are cooked with the liquid. Although the texture of these are lacking, they are excellent for adding flavor to soups, or as flavoring in salads or meats. One interesting suggestion is to add a small amount of dried boletes to ordinary cultivated white mushrooms to give the dish a much richer and deeper flavor. No matter how you eat ’em, boletes will give your food a meaty and earthy flavor reminiscent of the forest they came from. 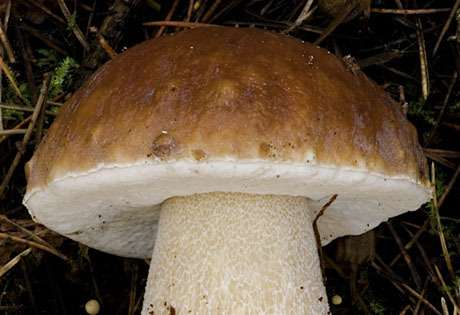 Please please don’t try to identify a king bolete from this article! Use one of the sources below or consult a knowledgeable mushroom expert. 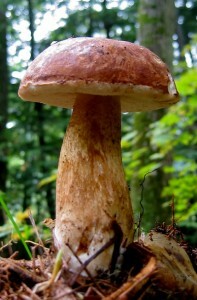 There are poisonous king bolete lookalikes in North America, in particular Boletus huronensis. Read more about this bad bolete in this personal poisoning tale by Andrus Voitk (McIlvainea 18: 32. 2009). Bessette Alan, Arleen Bessette, and David Fischer, Mushrooms of Northeastern North America. Syracuse University Press, 1997. Davidson, Alan. The Oxford Companion to Food. Oxford University Press, 2006. McGee, Harold. On Food and Cooking. Scribner, 2004. Wolfert, Paula. The Cooking of Southwest France. John Wiley and Sons, Inc., 2005. Image of B. edulis courtesy of Jared Grummer, a Cornell alum who now picks mushrooms in California. Image of Tylopilus felleus by Kathie Hodge. Some of the mushroom now a days is very useful to our health like “gano” most of all its really delicious. Just found some Zeller’s Boletes today. I haven’t tried them yet. Interested to hear that they are mycorrhizal. Still an ametuer. I fell into the trap of mistaking the Bitter Bolete for a Cep. Although I accounted for that occurance, making sure the worst thing that could happen is that, in false identification, it would taste horrible but I wouldn’t poison myself. I’m still on the hunt. I have heard accounts of mild poisoning symptoms for Boletus erythropus, but it may not be toxic for everyone. It may not be altogether safe to eat mushrooms raw; even well-known edibles can be toxic raw. Hunters of Boletus edulis in North America will want to read this story (PDF file) by Andrus Voitk. Andrus is a delightful writer, a brave mycophagist, and a mushroom guide author. Here he tells of his own experience with a poisonous lookalike of B. edulis named B. huroniensis. The article comes to us from NAMA’s flagship journal McIlvainea (named for an infamous American popularizer and eater of fungi). McIlvainea is online now!